Note - my bandwidth on 4 shared is almost used up - I've added to it a couple of times this month, but with just one day left, I'm not too inclined to do it again this month. If you're not able to get the download, I'll be listing an alternate link tomorrow also (after it's set up). Otherwise, you will be able to access it after the 1st. Sorry for any inconvenience this may cause - I will leave the links for the kit active until next weekend. 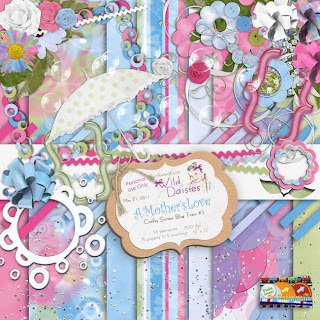 June 1st will be the start of our next Daily Download Series - the "From This Moment Add-on" kit. I'll also have the full-sized kit along with a word art and bonus embellishments package previews posted tomorrow, and available for purchase on Tuesday. One last thing . 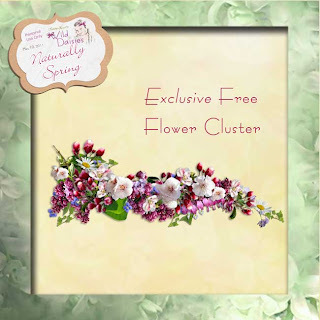 . . this is the last REGULAR download for the Naturally Spring kit. I have a SUPER package of goodies for you tomorrow to celebrate the successful conclusion of my first download series. I hope you'll LOVE IT! THANK YOU ALL for the support and encouragement this last month. I've had more fun than I thought would be possible, and have met some really wonderful people. You really do brighten my days with your comments and messages. Thank you, thank you, thank you. I hope you like it! 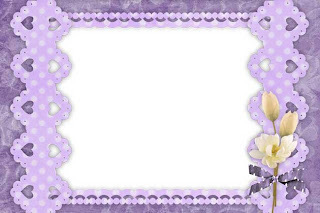 I think it will be great for wedding albums, anniversary, baptism, communion, confirmation, and other special occasion layouts. I can't wait to see what you do with it! I've certainly had fun playing with the kit . . . maybe too much fun. I better get to work here and list the Day 28 download . . . Happy Friday! Hope you're ready for a long, fun holiday weekend. Here's today's part of the kit. Wow, can you believe it's almost the end of May already? This month has just flown by, as they all seem to do. Please send out a thought or prayer for all of those suffering from the recent tornadoes. It's just an unimagineable experience to go through, and these were so excessively destructive in both lives and property. Let's hope the rest of the season will bring safety and healing to all. Remember to cherish every single day, and spread a little love. Here are today's pieces of the kit - click on preview for download link. Here we go for Wednesday . . . have a great day! Happy Tuesday! Here's today's download. Have a great day . . .
Hope you had a great weekend and weren't rained out like we were. At least the plants are growing, and flowers are blooming - that looks beautiful in the sun AND the rain. I'll get right to the download today, I'm trying to finish off my layouts for the Crafty Scraps challenges before the last possible day (you should try them, they're fun!). I did figure out how to get a little gallery on the blog, so if you would like to share anything you've made with the kits I've given away, I'd love to see! 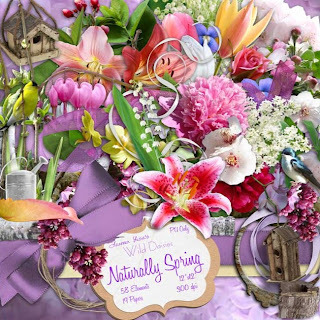 I'm still new to this, so I only have 3 kits so far, the April Blog Train Kit "Spring Whispers", the May Blog Train Kit "A Mother's Love" and the current kit "Naturally Spring". Send a link to your photo album (or gallery), or send a copy of the file by e-mail and I'll get it posted. THANK YOU! Hello, and Happy Sunday! I hope you found all of the goodies from yesterday - if not, take a look back in postings - there are several downloads that you might like! There is a new link added for a gallery - it's not set up the way I want right now, but I wanted to get something up to show you what Arlene has done with the kit so far. Fun! I'll get the gallery figured out, and hopefully we'll have more to add (hint hint). Here's today's download, thanks for visiting! THANK YOU to Arlene! She made this beautiful set of clusters out of the daily downloads, and wanted to share them with you. She doesn't have a blog up and running (yet - I'm trying to convince her how easy and fun it is!) so we're sharing them here. Please feel free to leave her some comments here, I'm sure she'd appreciate them very much! Again, THANK YOU Arlene for sharing your talent with all of us. Lots going on today! Be sure to scroll down (or back) for the freebies in the previous 2 posts - a whole kit is being given away in the Crafty Scraps "Choo Choo" Blog Train posting, along with several other kits and freebies at the other blog train stops. 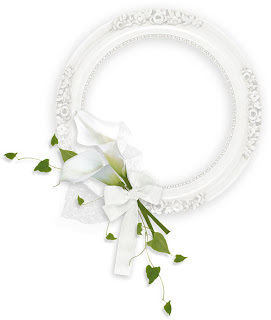 There's also another free frame cluster from the new wedding kit, From This Moment. Have a wonderful weekend ~ be sure to give away a few free smiles today! The new kit should be ready for a June 1 debut - just in time for the June weddings! Here's another freebie I made while reviewing the kit - if you missed the previous ones, check out the postings under "My Kits" and you should find them all. Hope you enjoy it half as much as I enjoyed making it! Click on preview for download - full sized png image will show up; then use the right side button on your mouse, click and choose "save as" to your computer. Thanks for visiting, hope to see you back soon! 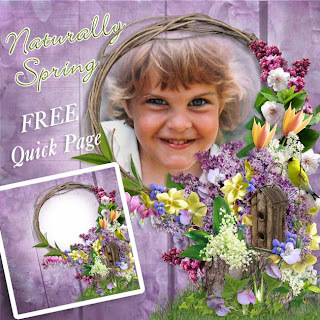 Be sure to take a moment if you can to check out the free kit being given away in the daily downloads - Naturally Spring. BLOG TRAIN with FREEBIES is HERE! I hope you've found your way here from Dina's blog - if not, the links to all of the stops on the train are shown below. Here's my contribution to the train - a fun little kit in some really pretty colors for Spring! 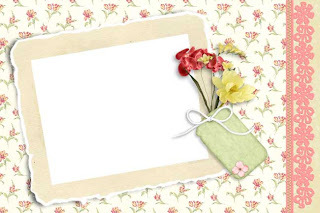 Be sure to check out the rest of the current postings, there are a whole bunch of freebies here for you! Also, follow the links below for the rest of the train - there are lots of coordinating kits and freebies! It's FRIDAY!!! Our blog train is running tomorrow - please be sure to check back for all of the freebies! I've had a sneak peek at the other kits, and I know you'll just love them all ~ the colors are great, and the designs are awesome! 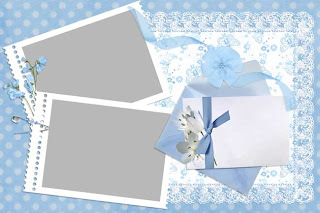 Check out the blog train blog for even MORE freebies that have already been posted . 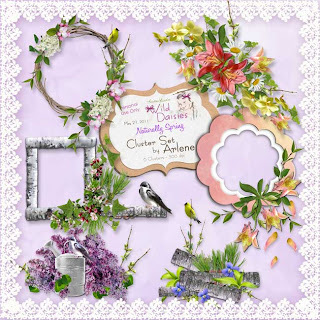 . .
Hopefully you have enough pieces of the Naturally Spring kit to make some clusters or layouts ... if so, please send me a link, I'd love to see (and show off on my blog) what you've made! Here's today's download . . . Thanks for visiting -- hope to see you tomorrow for the regular daily download, plus the whole blog train set of kits and other goodies! Hello! What a beautiful day it's supposed to be for us today. I just love seeing the SUN! I'm getting SO close to done with the wedding kit I've been working on. I just keep adding more and more to it, it's hard to know when to stop! I've started on the preview though, so I'll have to stop adding more pretty soon. It's very traditional, a bit formal, and will hopefully work for you whether in wedding or other layouts. I should have a few more layouts to see and freebies to start giving away soon! Well, on with today's download . . .
Another day ... another download. Still having fun? I hope so! Hope you're liking the kit. I'm sure enjoying getting the next one ready, actually, I have a couple I'm working on! Can't wait to share. Have a great day, and enjoy the flowers! Please remember - BLOG TRAIN on Saturday! There are several great kits and lots of freebies coming your way! Happy Tuesday! It's back to work for me today, so I'll be quick ... have a great day! 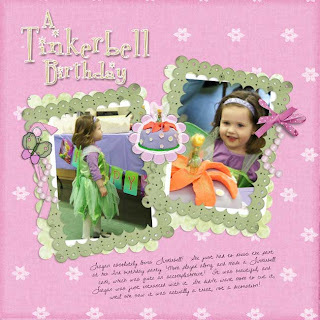 Dina's Challenge at Crafty Scraps - FREE KIT! 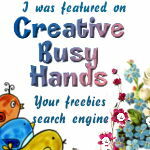 I love doing the challenges over at craftyscrapschat.com - they're fun, and you get tons of free stuff! I did the "Quote Challenge" hosted by Dina of Best Kept Memories, and we got a free mini-kit to make it with! Super cute, and really fun to see what other people come up with from the same elements and papers. Take a look if you get a chance! I used the same mini-kit for the template challenge there also, hosted by Julie's Creations. FUN stuff, and it makes you actually get your scrapping DONE. Yippee! Give it a try! Anyone can join in, no matter what level of experience you have. It's a great opportunity to meet some great people and get some fresh inspiration. Good morning! Here we go for day 16 . . . over half done now! Sorry if you missed the link to this one - it was from the day that Blogger was down and I just lumped it in with the same posting as #12 . . . just in case you missed it, here's the link. Thanks for visiting!!! I thank you so much for your comments also, I wish I could reply back to each of YOU with a "thanks" but I don't know how to reach y'all. So I'll say it here. I'd love to see anything you may come up with using the kits . . . send me a link if you want at mslisa@frontiernet.net. Thanks! I'll be back with day 15 in a few hours . . . have a great Saturday night! Happy Weekend!!! Hope you have a great one. 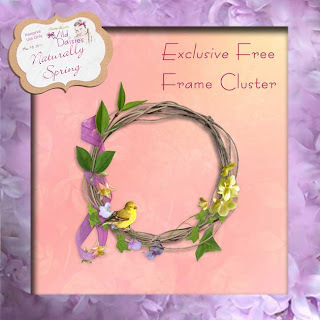 Here's today's download for the Naturally Spring kit . . . click on preview for link. Just a quick reminder that next week is the Crafty Scraps Choo Choo Blog Train for May - you can pick up a whole lot of freebies, mini kits, and goodies from the designers. For a free preview and exclusive gift, check out the blog and get signed up - it's free, quick, and really fun to follow! Sneak Peek - "From This Moment" Wedding QP FREEBIE! 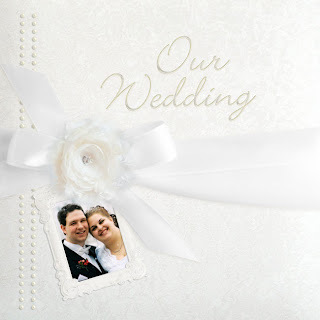 Here's another sneak peek at a little bit of the wedding kit I'm almost finished with called From This Moment. You'll be the first to know when it's done! Before I say anything else, I'd really like to thank you for your nice comments! I'm not sure how to get in touch with you personally and thank you, so I'll hope you read this. To the lovely lady who commented about the bleeding hearts, I'd love to say that my mom always had them in our yard and I know just what you mean about the nostalgia hitting you. To the "grandma" who says she looks forward to this as her first download site of the day, THANK YOU! I know exactly how you feel - I am always a little excited to see what's awaiting me at MY first stop of the day! It gets to be a ritual, and I really am honored that you feel that way about coming here. All of the other nice comments too ... boy, I never knew it would be like this, or I would have started much sooner. It definitely gives me a lot of incentive to keep on doing this. Ok, enough mushy girly stuff I guess. Well, not quite enough. Here's the link to the freebie QP I came up with. I tried to make it a little less frilly this time, but still elegant. Hope you like it! Have a great day! The lovely bride in the preview below is my daughter, at her wedding 6 years ago. Thanks for checking this out today! 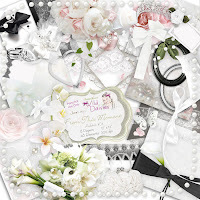 Be sure to scroll down and take a look at a bonus sneak peek QP freebie from the new wedding kit "From This Moment" which is almost complete and ready for you to play with. 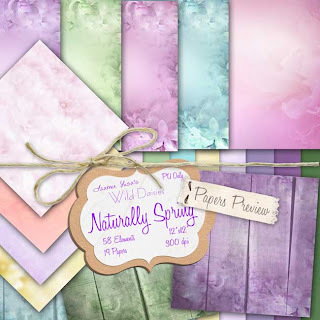 For now, here's today's download for the Naturally Spring kit. Have a GREAT Thursday! EXCLUSIVE From This Moment WEDDING QP FREEBIE! I posted this previously this week, but Blogger deleted a few postings, so here's the link again. Have a GREAT day! Blogger was having some problems and a few of the posts I made earlier this week were deleted. I'm re-posting them for you ... thanks for your patience! Hello and thanks for visiting! Here are today's pieces of the kit . . .
Day 10 already! Wow, how time flies when you're having fun, which I certainly am. Have a great day! I modified the flowers a bit from the cluster on the 2nd Frame Cluster I did for this set, trying to make it work for my blog header - it didn't. So . . . just in case someone could use it for something, here it is. It might save you a little work putting something together . . .
Click on preview for download link . . .
Click on image for download link . . .
Sorry-Monday's download will be a little late. I'm out of town and the file didn't upload last night correctly. I'll have it up by the end of the day when I get home. Thanks for visiting though! Hope y'all had a great weekend. Happy Mother's Day to all mothers! Hope you're having a beautiful day wherever you may be. I'm visiting my mother today, so I'll be quick . . . here's today's download. Thanks so much for dropping by - I appreciate it very much! Click on preview for download . . . Happy Friday! Hope you had a great week and have something fun planned for the weekend. Here's today's download pieces - hope you're having half as much fun as I am with this. Have a great day! Here's today's download ... be sure to check previous post for another little frame cluster. Have a great day! Here's a QP made from the Naturally Spring collection now on the daily downloads. NOTE: when putting your picture behind the QP, you may have to fade the edges gradually if they're close to the beginning of the soft-edged frame opening. Thanks for visiting! Be sure to check back tomorrow for more . . . Thanks for the nice comments that several of you have left - I appreciate them VERY much! Here's Monday's pieces of the kit.